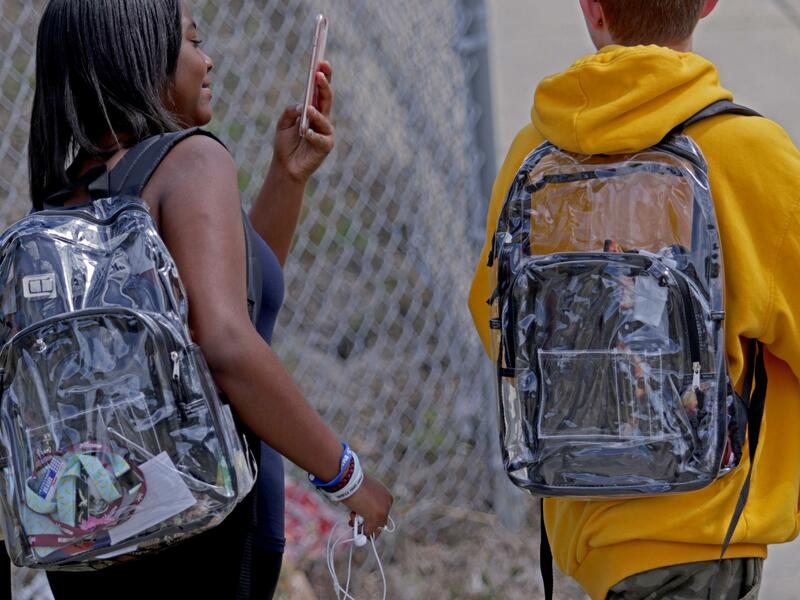 Students wear clear backpacks outside Marjory Stoneman Douglas High School in Parkland, Fla., on Monday. The bags are one of a number of security measures the school district has enacted as a result of the Feb. 14 shooting at the school that killed 17. The school discipline policies in Broward County, Fla., designed to be more equitable and more effective than what they replaced, have become exhibit A in what's already a national debate. The debate in many ways comes down to this: What's more important — cold steel or warm hugs? Harsh consequences or second chances? Do we achieve safety and security by making schools harder — or making them softer? To understand the debate that's raging now, between the "hards" and the "softs," you have to go back first to March 31, 1994. That's when President Bill Clinton signed the Gun-Free Schools Act. The law mandated that if a student brought a firearm to school, law enforcement would be notified. Lesser offenses like bringing "dangerous drugs" or other weapons to school triggered automatic and severe punishments. The next two decades were the era of the hards: "zero tolerance" policies. Police officers became more common in schools. As did physical security measures, like metal detectors. As did arrests. Especially for black and brown students. In Broward County, in the 2011-2012 school year, the state Department of Juvenile Justice reported 1,062 school-related arrests, the highest number in the state. Seventy-one percent of these arrests were for misdemeanors. The media reported arrests of students for throwing a spitball or a lollipop. "There was outrage," says Desmond Blackburn, a longtime educator in Broward. He began his career as a math teacher in the early 1990s, and rose to become chief of schools under Broward Superintendent Robert Runcie. "Broward was highlighted in that report as a critical problem — the worst district in the state." At Runcie's direction, the district partnered with law enforcement, the local NAACP and other organizations to create a new approach to discipline and behavior. This included a diversion program for students caught for certain misdemeanor offenses, like drugs, vandalism or fighting. Rather than be referred to law enforcement or the juvenile justice system, they were supposed to get targeted counseling, such as drug rehab, or if necessary sent to an alternative school. The diversion program had one of those awkward public-policy acronyms: Preventing Recidivism through Opportunities, Mentoring, Interventions, Supports & Education — PROMISE. The agreement on school discipline was signed in 2013, and right away, student arrests dropped. So did recidivism, reportedly. PROMISE made headlines as a national model for ending the school to prison pipeline. Students who messed up could get a second chance. "My freshman year, I was hanging out with the wrong group of kids," says BriAnne, who's now 17. We're using only her middle name to protect her privacy. As a freshman, BriAnne got caught using drugs. "There was peer pressure involved. You know, you do things you don't really mean and simple mistakes." She spent 10 days in the PROMISE program and she got some extra help. BriAnne just graduated from high school and she's now headed to a local college with hopes of studying medicine. "What stood out to us about the PROMISE program was that it really was this community-wide response," says Becca Bracy Knight, executive director of the Broad Center, which focuses on improving education in urban schools. "We definitely had a lot of people interested in learning from what was happening in Broward." That interest intensified when, in 2014, the U.S. Department of Education issued guidance saying, in no uncertain terms: School discipline is a civil rights issue. If you are suspending, expelling and arresting disproportionately more children of color you will be investigated and quite possibly censured. The era of the softs began. Instead of zero tolerance, more than 50 of America's largest school districts instituted what might be called expanded tolerance — discipline reform. More than half the states revised their laws with the intention of reducing suspensions and expulsions, which were redefined as "exclusionary discipline" that, data shows, are associated with higher dropout rates. "Restorative justice" came in vogue. Students who fought or who cursed out a teacher might be asked to "circle up" and work their problems out with words. Students who had outbursts in class might be given special accommodations, "time in" in a quiet corner or a trip to the social worker's office. "Positive behavior intervention" meant students sometimes got incentives for not acting up. These new policies were adopted with varying degrees of buy-in, professional development, resources and success. In the worst-case scenarios, what you had were unfunded mandates for school leaders to improve certain statistics. "If you say 'stop suspending students or you're in big trouble,' that's not enough," says Knight at the Broad Center. "You have to provide a suite of services and supports and make sure you're measuring the right things." She says Broward was doing all of that, but that some districts might not have been. She likens the issue to other areas in education reform, such as the pressure to improve graduation rates, which can lead to real improvement, or to juking the stats. Critics of the soft approach, like Jonathan Butcher, a senior policy analyst at the Heritage Foundation, go further. He says schools have fallen prey to a "culture of tolerance and leniency that allows students like Nikolas Cruz to fly under the radar in a way that puts kids at risk." Cruz was the shooter at Marjory Stoneman Douglas. He didn't exactly fly under the radar while at school; he was suspended multiple times for a range of offenses and eventually expelled. However, no one was happy when WLRN reported that Cruz was referred to the PROMISE program after an act of vandalism in middle school. Superintendent Runcie had previously said that Cruz was not a part of the program. Apparently Cruz never participated in services and no one has said why. This led to questions about the program's recordkeeping, and its reported low recidivism rate. And Butcher's criticisms of lax discipline have been echoed by many parents in the district. Andrew Pollack, who lost his daughter, Meadow, in the shooting, has met with President Trump to push for stronger security measures. On a local radio show, he called PROMISE a "cancer." "The leniency policy, the political correctness — that's a cancer that led up to February 14th of non-reporting of criminals that go to the schools in Broward." Butcher at the Heritage Foundation points out that, had Cruz been arrested at some point during his school career, Florida law might have prevented him from buying a gun. "Clearly there's a troubling tension between keeping a school community safe and limiting interaction within the juvenile justice system," he says. "Where does that leave discipline when safety is in play?" Grieving parents like Pollack and Lori Alhadeff are looking for change. Alhadeff is running for the school board, and has founded a nonprofit called Make Our Schools Safe. "I think if people make mistakes, we should give them a second chance," she says. "However, we've gone to extremes. We've gone from overdisciplining to underdisciplining." All this is taking place as Education Secretary Betsy DeVos has been backing away from enforcing that Obama-era federal guidance about disparate discipline. She's met with critics of the guidance. Her department has narrowed its civil rights investigations. DeVos is heading up a federal school safety commission that, she has said, won't look at gun control; but it is charged with "hardening our schools." So the pendulum looks poised to swing back from "softs" to "hards." In Broward County, Superintendent Runcie has said, "Everything's on the table. We're going to be looking at our whole entire discipline system." Civil rights advocates like Dwanna Nicole are worried. She's director of policy and stakeholder outreach at the Advancement Project, which helped consult on the creation of the PROMISE program. She notes that despite nearly a decade of reforms, racial disparities in discipline haven't gone away. "We've been fighting for a long time to get smaller class sizes, more money for school counselors, and the message has been: there isn't money," Nicole says. "Now all of a sudden there's money for more guns, police, metal detectors." This is what Nicole labels security, as opposed to safety: "History shows us most of that equipment will go in schools that serve young people of color. And we have so many examples of young people of color being harmed by police. I think it's a very real fear because this has happened many times before." David Osher, a school safety expert with the American Institutes for Research, also makes the distinction between security and safety. "Things I might do to make a school very, very physically safe may make students feel less safe," he says. School shootings are still very rare, and shouldn't be our only concern, he adds. He cites the example of a school that instituted metal detectors at the entrance, leaving students to wait in line outside in the cold unsupervised. When students feel disrespected or treated as criminals, it may backfire and actually exacerbate violence. "We could create the equivalent of a fallout shelter" for students to attend, he says — but would we want to? In theory, schools could invest in both counselors and officers; in quiet corners as well as reinforced steel doors; in clear consequences as well as positive supports. But in the real world there are often tradeoffs. Desmond Blackburn is more aware of those tradeoffs than most. Blackburn now leads a national nonprofit called the New Teacher Center. And he serves on the Marjory Stoneman Douglas High School Public Safety Commission, set up by Florida Gov. Rick Scott, a Republican. "What is going on in our schools is forcing school leaders to think about things that, quite honestly, we never had to think about before," he says. "I have two kids and I could not fathom one of them not coming home one day." He says despite his role in implementing PROMISE, he will not blink from investigating its possible contribution to the horrific events of Feb. 14. The school year has come to a close in much of the country, but the national debate over how to make schools safer goes on. After mass school shootings in Florida and Texas, there have been calls to harden schools - more security, tougher doors, tougher windows, arming teachers. And then there are those who say schools should be softer, more welcoming, places where students can make mistakes and troubled students can get help. One hot spot for the debate is Broward County, Fla. - that's home to Marjory Stoneman Douglas High School. We begin our report with Jessica Bakeman from member station WLRN. JESSICA BAKEMAN, BYLINE: Over the past five years, thousands of students in Broward County who got in trouble for doing something like smoking pot or fighting at school were referred to what's called the PROMISE program. Like BriAnne, who's 17 and just graduated from high school - she's now headed to a local college with hopes of studying medicine. We're using just her middle name to protect her privacy. BRIANNE: My freshman year, I was hanging out with the wrong group of kids. There was peer pressure involved. You know, you do things you don't really mean and simple mistakes. BAKEMAN: BriAnne got caught using drugs and spent 10 days in the PROMISE program, which is housed at an alternative school, where she got some extra help. The diversion program offers intensive, targeted counseling. For example, if students get in fights, they can get instruction in anger management or conflict resolution. If it's drugs, maybe substance abuse help. BRIANNE: You're lucky if you get the chance to redeem yourself and try again. BAKEMAN: The Obama administration made PROMISE a national model for how to limit the so-called school-to-prison pipeline. But programs like these have come under scrutiny since the shooting by a former student at Marjory Stoneman Douglas High School. The shooter, it emerged, had been referred to the PROMISE program. It's unclear whether he participated. That gave opponents of these softer discipline approaches a huge target. UNIDENTIFIED PERSON #1: I want to talk about PROMISE. UNIDENTIFIED PERSON #2: Eliminate the PROMISE program. UNIDENTIFIED PERSON #3: PROMISE program - it allowed potentially dangerous students to be in traditional public schools. BAKEMAN: Critics like these speakers at public forums here in Broward and around the country say the PROMISE program is an example of lax discipline policies. They worry students are getting away with dangerous behavior and putting other kids at risk. Andrew Pollack, who lost his daughter, Meadow, in the shooting, has met with President Trump to push for stronger security measures. He recently called PROMISE a cancer. ANDREW POLLACK: Leniency policy, the political correctness, that's a cancer that led up to February 14 of non-reporting of criminals that go to the schools in Broward. BAKEMAN: Max Schachter's son, Alex, also died in the shooting. MAX SCHACHTER: Everybody needs a second chance. But at some point, we need to hold everybody accountable. BAKEMAN: He and other parents of victims are part of a local task force and a state commission. Both are considering the role discipline policies might have played in their efforts to make sure what happened on February 14 doesn't happen again. SCHACHTER: We don't want these kids to slip through the cracks. ROBERT RUNCIE: Everything's on the table. We're going to be looking at our whole entire discipline system. BAKEMAN: The chair of the state commission that's investigating the shooting, Bob Gualtieri, is sheriff in Pinellas County, which includes St. Petersburg. His group spent hours questioning state and local school officials about PROMISE earlier this month. BOB GUALTIERI: We need to determine whether the PROMISE program had any bearing or impact. BAKEMAN: If they decide that it did, what happens next will be up to Florida's state legislature when it reconvenes in March. And any changes to the PROMISE program will be closely watched around the country. For NPR News, I'm Jessica Bakeman in Miami. Transcript provided by NPR, Copyright NPR.